During this 2017 summer and fall season, we will publish a bite-sized weekly recap of the action across the Club Division. This will serve as a supplement to our standard tournament reporting and will offer a high-level look at the latest happenings and the biggest stories of the week. It was a wild weekend in the women’s division of the Elite Select Challenge, as only one pool went to seed and upsets littered the bracket. On Saturday, #18 Chicago Nemesis took Pool D after surprising double game point wins over #12 Columbus Rival and #11 Texas Showdown. Elsewhere, #6 Seattle Underground was upset by #20 San Diego Wildfire, and #16 Portland Schwa took down #10 San Francisco Nightlock. In the bracket, Nemesis snuck out a two point victory over #19 Minneapolis Pop in the quarters and then advanced past Wildfire with relative ease. In the final, the Chicagoans notched another impressive win over a #6 Seattle Underground squad with an extra game on their legs. Despite their four-point final loss, Seattle rebounded well from their pool play loss with impressive wins over Rival, Schwa, and Showdown in the bracket. After winning their pool,#9 Madison Heist — playing without Georgia Bosscher — fell to Showdown 12-9 in the quarterfinals, even with the extra rest earned with a bye. Many of the teams at ESC have now wrapped up their regular season and made their final case to earn a strength bid for their region. 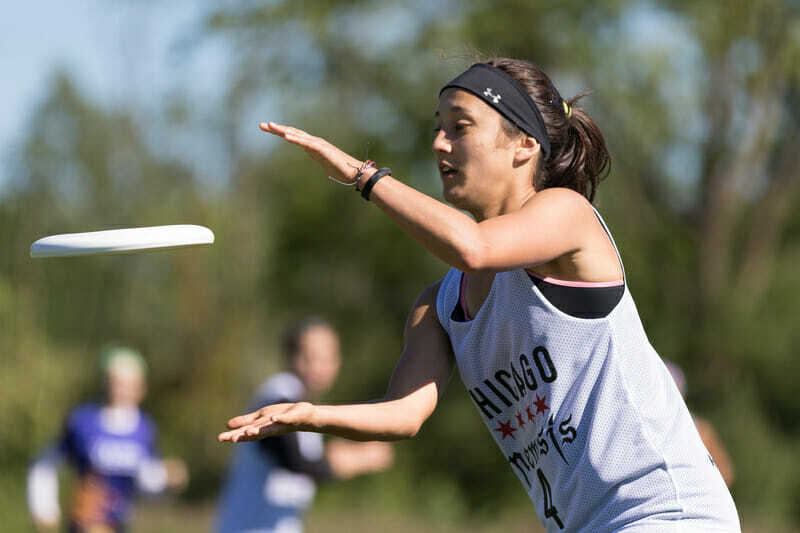 Coming into the weekend with little in the way of external expectations, Chicago’s strong results in Appleton were enough to catapult Nemesis up the USAU rankings and, at least for now, have moved a bid from the Southwest to the Great Lakes. The wild upsets of the weekend are sure to play a huge role in deciding the final rankings released in two weeks. For more coverage of the women’s division at the Elite Select Challenge, check out all the scores and stay tuned for our upcoming recap. Salt Lake City Elevate took their hometown tournament Ski Town Classic 11-8 over Bay Area FAB. Unfortunately, the awesomely named Oakland Deadly Viper Assassination Squad got Five Point Palm Exploding Heart Techniqued in quarters. Top seed Chicago Dish rolled through competition before downing crosstown rival Helix 13-11 in the finals of Cooler Classic 29. #6 Michigan High Five put together a complete tournament performance highlighted by their second half play on their way to winning the Elite Select Challenge in their final tournament of the regular season. After a closer than expected start against #22 Madison Club, High Five took the pool with relative ease. In quarters, they fell behind #18 Atlanta Chain Lightning before mounting a second half comeback to win 12-9. The same happened in their semifinal matchup against #21 Minneapolis Sub Zero before winning on double game point. In the final, High Five held a 7-6 halftime lead on serve before rattling off three straight breaks early in the second half and maintaining that lead to claim a 13-8 victory over #10 Boston Dig. Apart from High Five, the story of the tournament is the downfall of the North Central as Madison Club dealt with infighting and a misfiring offense to lose all three pool play games and Kansas City Prairie Fire continued their streak of poor play to similarly finish 0-3 in pool play. Sub Zero becomes the odds-on favorites for a region that will almost assuredly finish with just a single bid. For more coverage of the men’s division at the Elite Select Challenge, check out all the scores and stay tuned for our upcoming recap. At Rocket City Invite, #13 Florida United almost certainly earned the Southeast a bid with max points wins over #24 Huntsville Freaks and an undefeated weekend. Chicago Haymaker and Milwaukee MKE both entered the finals of Cooler Classic undefeated, as Haymaker pulled off the upset 15-10. The four-team round robin of Florida Warm Up Club saw Tampa UpRoar taking the pool and Miami El Niño finishing second. #3 Seattle BFG claimed the Elite Select Challenge championship last weekend, but not without a few scars. In their final round of pool play, they fell to #13 Washington D.C. Ambiguous Grey 10-6, but still won the pool in a three-way tie. Quarters saw them matched up against #5 Boston Wild Card who BFG narrowly escaped 12-10. It was a similar story in the semis and final. Seattle edged out a three-point win over #14 Madison NOISE and needed a huge comeback to manage a two-point win over #11 Fort Collins shame. to take the tournament. Despite some lingering questions about their bona fides entering the weekend, BFG was clearly among the favorites in Appleton; while the tournament title cements them among the elite tier in the mixed division, the pool play loss and narrow wins in the bracket could point to cracks in their now semis-favorites status. Elsewhere in Appleton, Dallas Public Enemy recovered from their early season troubles at the Pro-Elite Challenge and revived their status as a Nationals-quality team. They won their pool and made a run to semifinals before falling by one to shame. The performance vaults them up the rankings and has positioned the South Central to end up with three bids come Regionals. NOISE also outperformed expectations, similarly winning their pool and then earning a spot in the semis; they capped their weekend with a dismantling of Public Enemy in the third place game. Pool D was a mess with Madison, #22 Pittsburgh Alloy, and shame. all finishing 2-1. In Pool C, #10 San Francisco Polar Bears had a disastrous weekend, going 0-3 in pool play after coming in as the #3 overall seed. Those results may cost the Southwest a bid — or perhaps two. For more coverage of the mixed division at the Elite Select, check out our recap and all the scores. At Ski Town Classic, #24 Los Angeles 7 Figures beat Bozeman Bozos 10-9 in the final to cap off a perfect 6-0 weekend. Minnesota Star Power rolled through competition at Cooler Classic 29 in Hartland, WI. They beat Chicago Prion 15-7 in the final. The new Tunnell sibling-led team in the Northeast looked dominant at Chowdafest, as Amherst Happy Valley took the title with an impressive 7-0 weekend. In a three team round robin at Florida Warm Up Club, St. Petersburg Mutiny went 4-0 as Orlando Swag State and Jacksonville CimaSalta split their two games. Most of the nation’s top-tier teams are off this weekend before the regular season concludes over Labor Day weekend with the Pro Championships and the NY Invite. But there is plenty of other action on tap for this weekend, as many club teams head into a final tune-up before Sectionals. Indy Invite Club will have play in all three divisions this coming weekend in many teams’ last tournament before the Series. Sanctionals in Fremont, CA and KC Mashup in Kansas City, KS will offer Mixed competition. CBR Memorial in Lacey, WA and Beaumont Oil Spill in Beaumont, TX will offer teams a final bout of men’s play before the postseason begins. Comments on "Club Update: Teams Make Push For Bids At Elite Select Challenge"